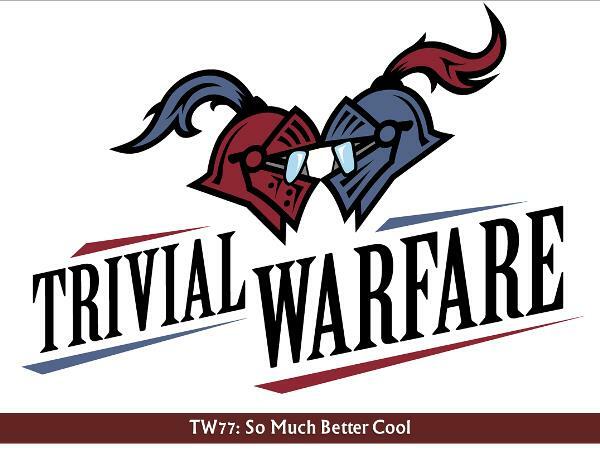 It's girls vs. boys in a shirts and skins episode of Trivial Warfare! Ok, that was a blatant lie. It's not shirts and skins, but it is girls vs boys! Carmela teams up with guest Carolyn Broughton to show off just how good girl nerds can be at trivia. On the other end Jonathan is anxious to right the ship. Chris hosts today's game, enjoy! Sign up for a free trial of Audible at www.audibletrial.com/TWA You won't regret it! Sign up for a Lootcrate subscription to get awesome surprise nerdy stuff delivered to your door each month. Go to www.lootcrate.com/TWA and use the coupon code TWA! Want to support the show financially and join the Trivial Warfare Army? You can do it at www.patreon.com/TWA.